People are drinking it to lose weight, improve their skin and nourish their joints. This article takes a detailed look at bone broth and its health benefits. Bone broth is a highly nutritious stock made by simmering animal bones and connective tissue. Using acid, such as vinegar or lemon juice, breaks down the collagen and connective tissue. This leaves you with a tasty, nutritious liquid commonly used in soups and sauces. Bone broth has recently become a trendy beverage among the health conscious. In fact, many people swear by drinking a cup a day. You can make bone broth from any animal bones, but a few popular sources include chicken, turkey, lamb, pig, beef, wild game and fish. Any marrow or connective tissue can be used, including feet, beaks, gizzards, spines, legs, hooves, hocks, whole carcasses or fins. 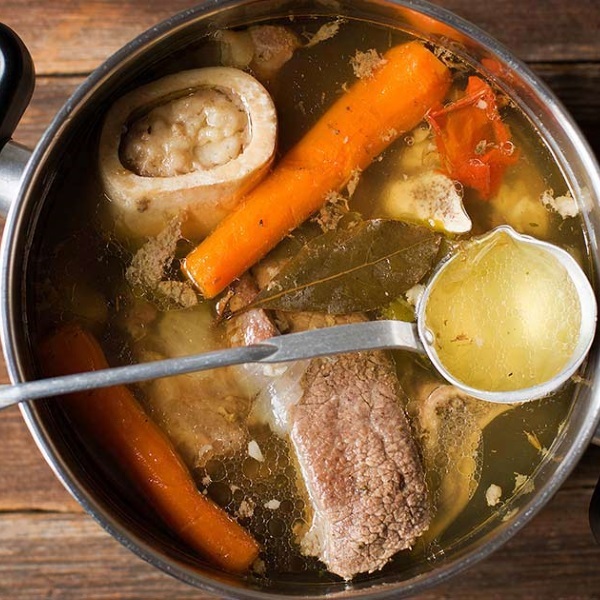 Bottom Line: Bone broth is made simmering animal bones and connective tissue. The resulting nutrient-dense liquid is used for soups, sauces and health drinks. What Nutrients Does Bone Broth Contain? Bone: The bone itself yields minerals like calcium and phosphorus. Sodium, magnesium, potassium, sulfur and silicon are also present. Marrow: Bone marrow gives you vitamin A, vitamin K2, omega-3s, omega-6s and minerals like iron, zinc, selenium, boron and manganese. Marrow from beef and lamb also contains CLA. Connective tissue: This tissue provides glucosamine and chondroitin, which are popular dietary supplements for arthritis and joint pain. Additionally, bones, marrow and connective tissue are all largely made up of collagen, which turns into gelatin when cooked. Gelatin has a unique profile of amino acids, and is particularly high in glycine. Bottom Line: Bone broth contains many important vitamins and minerals, some of which are lacking in the Western diet. Making bone broth is easy, and many people don’t even use a recipe. All you really need is bones, vinegar, water and a pot. 2–3 pounds of chicken bones. 4 liters (1 gallon) of water. 1 teaspoon of salt and/or pepper (optional). Put bones and vegetables in a big, stainless steel pot. Pour water into the pot so it covers the contents. Add the vinegar, and then raise the temperature to bring to a boil. Reduce heat, add salt and pepper, and then let simmer for 4–24 hours (the longer it simmers, the tastier and more nutrient-dense it will be). Allow the broth to cool, and then strain the solids out. Now it’s ready. You can also add other meat, veggies or spices to your broth. Popular additions include parsley, bay leaves, carrots, celery, ginger, lemon rinds and liver. After it is done, you can store the broth in an airtight container in the refrigerator for up to 5 days, or in the freezer for up to 3 months. Instead of a pot, you may also want to use a pressure cooker, slow cooker or Crock-Pot. I personally use a Crock-Pot to make my bone broth, and it cooks while I sleep. Bottom Line: Bone broth is very easy to make, and all you need are a few simple ingredients. Bone broth is high in many different nutrients, which may provide some impressive health benefits. For example, it is high in various minerals, the protein collagen, the amino acid glycine and the joint-improving nutrients glucosamine and chondroitin. Keep in mind that no studies have looked at the benefits of bone broth directly, but we can make some educated guesses based on the nutrients contained in it. Anti-inflammatory: The glycine in bone broth may have some anti-inflammatory and antioxidant effects (1, 2). Weight Loss: Bone broth is usually very low in calories, but can still help you feel full. This may be due to its gelatin content, which can promote satiety (3, 4). Joint Health: Glucosamine and chondroitin, found in the broth, have been shown to improve joint health and reduce symptoms of osteoarthritis (5, 6, 7). Bone Health: Bone broth contains many nutrients that are important for bone health, including calcium, magnesium and phosphorus. Sleep and Brain Function: Glycine taken before bed has been shown to improve sleep and brain function (8, 9, 10). Bottom Line: Bone broth contains a number of healthy and beneficial nutrients. It may have anti-inflammatory effects, help with weight loss, improve bone and joint health, and improve sleep quality and brain function. Here are answers to the most commonly asked questions about bone broth. Where can I get bones? You can use bones from the previous night’s dinner, or get them from your local butcher. I personally keep leftover bones from meals in a bag in the freezer. The best thing is that bones are cheap, and often even free. Many butchers are happy to give the animal scraps to you instead of throwing them away. Is there a difference between bone broth and bone stock? Not really. These are essentially the same thing, and the terms are used interchangeably. How much of each nutrient is there in bone broth? Which animal the bones come from and what that animal ate. How much bone is in the recipe you’re using. Length of time the broth cooks for. Whether or not enough acid was used. If the meat on the bone you’re using was previously cooked. Very few nutrient calculations have been done for bone broth. Here is the nutrient breakdown for one recipe, although keep in mind that the factors above are unknown. How much glycine and proline are in bone broth? Again, it depends on the recipe and batch. However, bone broth is very high in gelatin. Dry gelatin, for example, may contain about 19 grams of glycine and 12 grams of proline per 100 grams (3.5 oz) (11). How much calcium is in bone broth? As with other nutrients, the calcium content of bone broth depends on many factors. Few studies have looked into this specifically, but one study from the 1930s reported 12.3 to 67.7 mg of calcium per cup of broth (12). This isn’t a very high amount. A single cup of milk, for example, contains almost 300 mg of calcium. Should You Try Bone Broth? Bone broth is high in many nutrients, some of which have powerful health benefits and are generally lacking in the diet. However, there is currently a major lack of direct research on bone broth. Given its increasing popularity, that is likely to change in the near future. At the very least, bone broth is a nutritious, tasty and incredibly satisfying addition to your diet.